Urban rescue teams, insurance adjusters and National Guard troops scattered across Florida Monday to dig out victims of Hurricane Charley and deliver water and other supplies to thousands of people left homeless. There's a vast vista of personal loss as far as the eye can see, and as CBS News Correspondent Mark Strassmann reports, people are starting to realize that surviving Charley was just the start. Now they have to learn to live with its aftermath. Tami Wilson, 45, of Port Charlotte, wiped a tear from her eye after picking up ice and water from National Guardsmen at a "comfort station" in North Point. She and her husband, Dewaine, haven't had a shower or a hot meal since the storm hit. "The hard part is not being able to bathe and not having food and water unless I go out and look for it. Last night, we almost gave up because it got so hot," she said. The lucky ones, like James Hill, lost just half their house. As Strassmann reports, Hill rode out Charley at home. "By the time it got strong to the category it was, it was a little too late for us to go anywhere," Hill said. "We just battened down the hatches and rode it out." "It's like playing Russian roulette," Schebel said. "You don't know if you're going to die or not with everything flying and going." At least 17 people were killed by the storm in Florida and officials estimate it caused as much as $11 billion in damage to insured homes alone. Earlier, Charley killed four people in Cuba and one in Jamaica. Nearly 1 million people remained without power, and officials said it could take weeks to get it fully restored. Some 2,300 people were in emergency shelters, and Federal Emergency Management Agency director Michael Brown said 11,000 have already applied for disaster aid. Brown said it could take several weeks to find all the victims, and officials still had no count Monday of how many people were missing. The search was slow in some areas because downed power lines and debris were making the search dangerous. Officials said early estimates that hundreds of people were missing could be inflated by erroneous reports made by worried relatives and friends. "The fact that we have not found any more dead than we have is nothing short of a miracle," said Guy Tunnell, chief of the Florida Department of Law Enforcement. In North Port, Darren Perreault sipped a cup of coffee outside the San Pedro Catholic Church activities center, thankful he and his 14-year-old son, Daniel, had a place to spend the night. Punta Gorda, a retirement community of about 15,000 people, and Port Charlotte in Charlotte county appeared to be among the hardest-hit areas, but federal officials expanded the disaster aid zone to 25 counties on Sunday. At a Red Cross shelter in Englewood, about 300 people woke up to a breakfast of scrambled eggs, bacon and milk. "It's starting to sink in," said one temporary resident, Jo Trail, who was staying there with her husband and 10-year-old grandson. 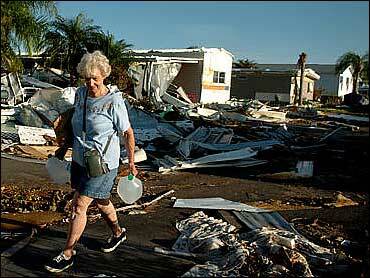 Trail's mobile home in Arcadia was completely destroyed, along with most of her possessions. The family rode out the storm lying underneath a mattress. After slamming into Florida with winds reaching 145 mph and a surge of sea water of 13 feet to 15 feet, Charley hit open ocean and made landfall again in South Carolina. It moved into North Carolina and up the eastern seaboard as a tropical storm before being downgraded to a depression Sunday. In and around Punta Gorda, trailer home after trailer home lay toppled. Others were blown apart entirely, exposing interior walls that had been pushed down flat. Splintered wood and shattered glass were scattered about. As the storm weakened off the coast of New England, President Bush surveyed the devastation from helicopter. He consoled storm victims in Punta Gorda, saying "A lot of people's lives are turned upside down." Federal emergency officials said the state has requested catastrophic housing for 10,000 people, and more than 4,000 National Guard troops have been activated. Lt. Gov. Toni Jennings said 2,000 insurance adjusters were already on the ground and 2,000 more were on their way. FEMA was sending teams of medical, urban rescue and communication workers in addition to supplies. Power generators, cots, blankets, hammers, nails and portable toilets were unloaded from planes and trucks by members of Florida's National Guard on Sunday, then reloaded for delivery to devastated areas. J.B. Hunt, a spokeswoman for the American Red Cross, said the agency has eight mobile kitchens and five feeding centers that will be capable of serving 9,000 meals a day by Monday. "This is the largest Red Cross response since Sept. 11," she said. On Monday, dozens of people waited in long lines to fill their gas tanks in North Port, where many people were going in search of supplies. Some stations had run out of fuel, creating lines of about 40 cars at times. But those waiting didn't seem to mind. "This is nothing," said Cindy McLean, 48, whose home was OK although she was still without electricity. "I have my home, I have my health and my kids are safe. That's what counts." State officials warned of price gouging, and promised to arrest offenders. The state had received about 400 complaints of price-gouging as of Sunday, and officials warned people not to pay cash for repairs. Law enforcement officials said Monday there had been no arrests for looting but six people had been arrested in DeSoto County for violating the curfew.